90% of people who are diagnosed with diabetes have type 2, which can often be prevented or delayed through increased physical activity, healthy eating and weight loss. We are committed to preventing diabetes in the communities we serve and providing support to people living with the disease. All of our diabetes education and support services are free and self-referrals are welcome. To join a program call (613) 258-6133, extension 400, option 4. For more information about our programs, call our Diabetes Nurse Educator, Carly Lang, at (613) 258-6133 extension 212 or our Registered Dietitian and Certified Diabetes Educator, Julia Hicks, at (613) 258-6133 extension 216. For Physicians: find a referral form to the KDH Diabetes Clinic here. 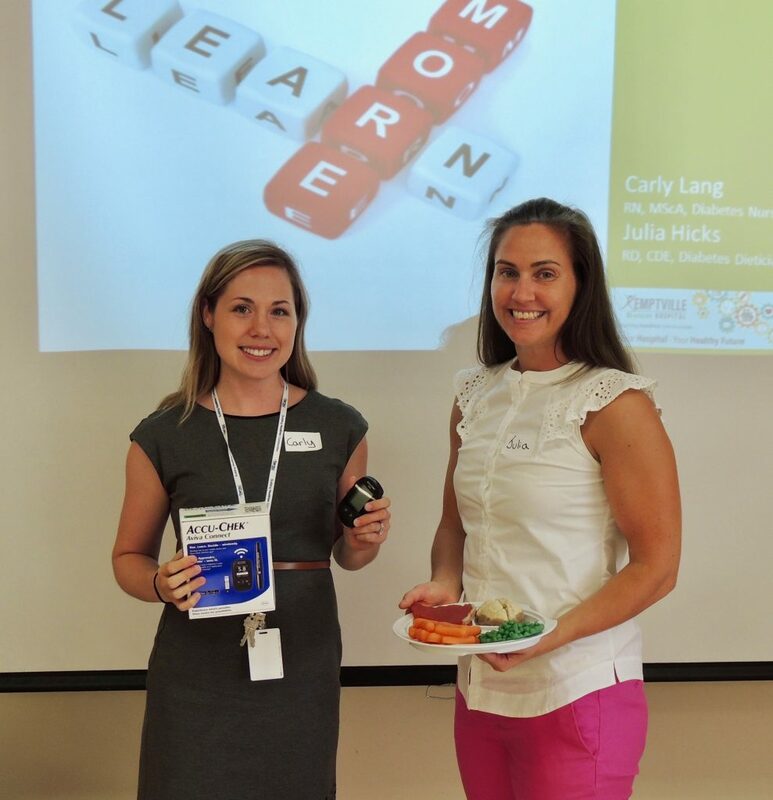 Pictured above are Carly Lang (left), our Diabetes Nurse Educator, and Julia Hicks, Registered Dietitian and Certified Diabetes Educator. Signs and symptoms of type 2 diabetes include unusual thirst, frequent urination, weight change (gain or loss), extreme fatigue, blurred vision, cuts and bruises that are slow to heal, and tingling or numbness in the hands or feet. If you are experiencing any of these symptoms you should see your healthcare provider right away for a simple blood-sugar test. However, some people with type 2 diabetes don’t have symptoms. This is why it’s important to be tested. Diabetes Canada recommends screening for diabetes for everyone once they reach age 40 and every three years after that.